(@jdungan) on the Confer App. It looked like an effective and efficient tool to use in the classroom. I played around with it a little the rest of the school year but didn’t end up using it in any big way. 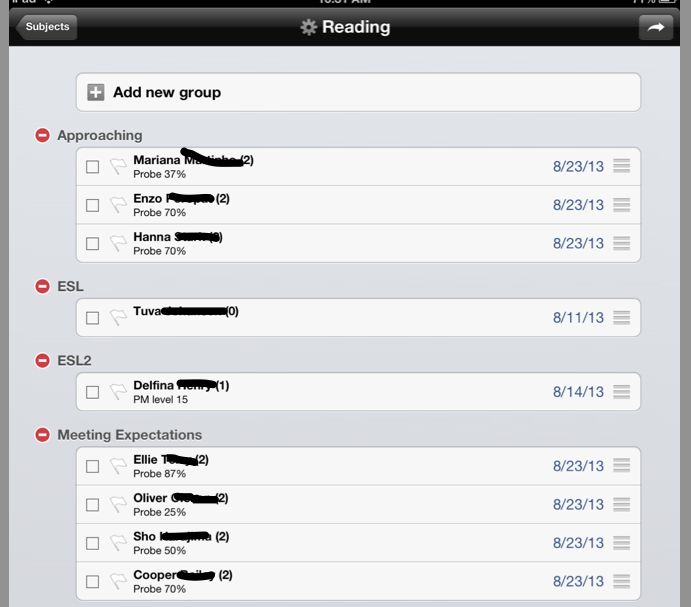 This year I decided to utilize the Confer App on my iPad as one of my main teaching tools from day one. If you are unfamiliar with the Confer App, please check out this site for more information. 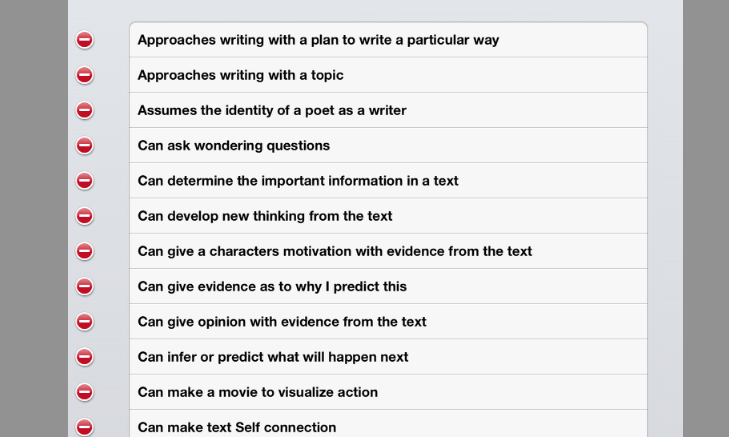 Confer is a ‘powerful student observation and note taking tool’. Gone are the days of clipboards with anecdotal post-it notes constantly falling off. All of your student data can now be in one place and easily manipulated to better plan and differentiate for your students. 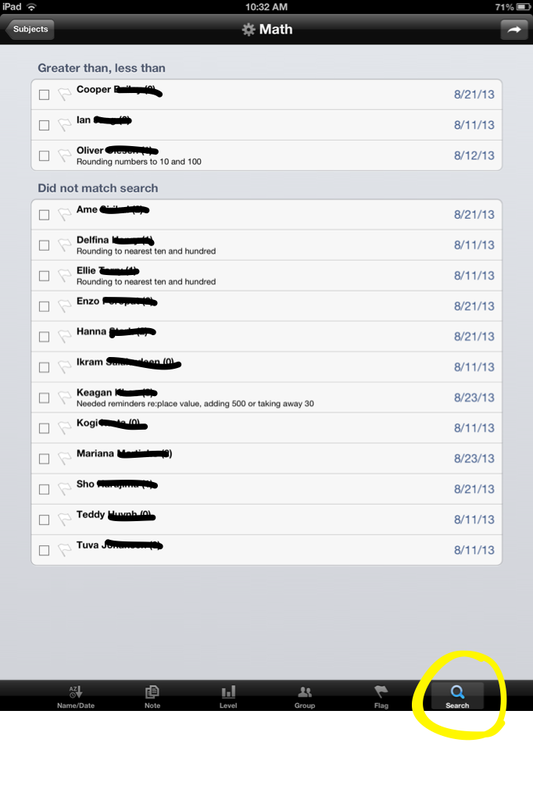 I started by inserting my class roster and text for specific subject areas I wanted to keep student data on. In the beginning I had a little trouble inputting text into some fields. But with a quick email to David Lowe, creator, (@conferapp) I had an answer and solution within a day or so. I love when the support for a tool is really there! The first screen in Confer lists all your subject groups you want to include. You can easily group your students for differentiated reasons. Students can easily be moved from one group to another. You can search for a particular skill or concept to identify quickly which students need support in that area. When you view by date, it is easy to see which students have not met with you recently and therefore helps you plan your group time for the day. 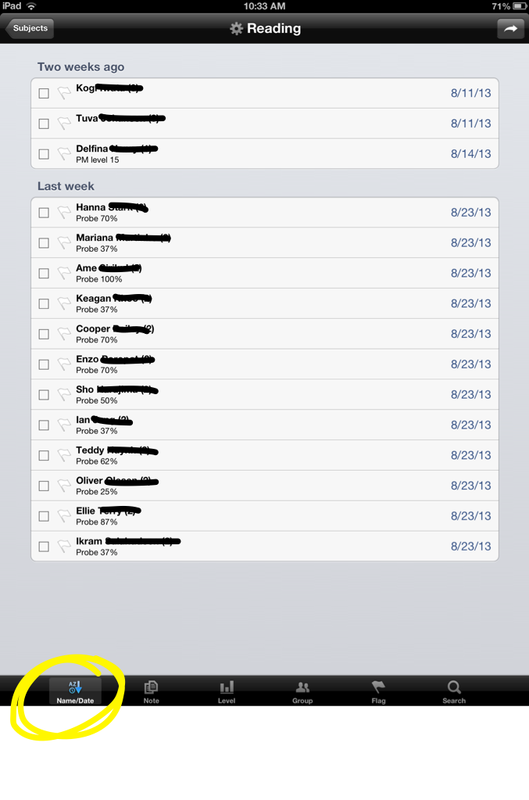 This is an example of text you can import and just click on when adding notes on a particular child. Any time you add any text it becomes available to click on for other students. I am at the beginning of my journey with Confer, but so far I am happy to have made the decision to use this app this year. I have found it super easy to collect observations and notes on my students. Differentiating lessons and small groups for readiness levels, interests, and learning styles is right at my finger tips. The Getting Started Guide included is very clear and helpful as well. From what I hear there will be updates to this app as well, including the ability to add photos to notes, which I am really looking forward to. This entry was posted in apps, PYP, PYP Attitudes, PYP Profile, Reading, science, teaching, technology, writing and tagged 21clhk, apps, assessment, differentiation, formative assessment, math, PD, technology, writing. Bookmark the permalink.